If the ISG related sensors or system error occurs, the yellow AUTO STOP indicator ( ) on the instrument cluster will stay on after blinking for 5 seconds and the light on the ISG OFF button will illuminate. 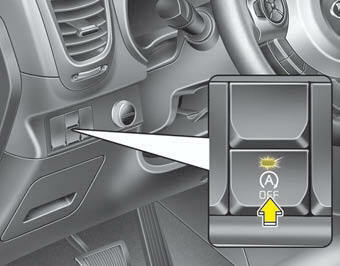 If the ISG OFF button light is not turned off by pressing the ISG OFF button again or if the ISG system continuously does not work correctly, please contact an authorized Kia dealer as soon as possible. Turn the ignition switch to the LOCK (OFF) position or remove the key from the ignition completely before performing work on the vehicle in the engine area. Failure to do so could result in serious injuries due to sudden engine reactivation. If the AGM battery is reconnected or replaced, ISG function will not operate immediately. If you want to use the ISG function, the battery sensor needs to be calibrated for approximately 4 hours with the ignition off and then, turn the engine on and off 2 or 3 times.